The simplest and oldest method of keeping fish alive till cleaning is a fish stringer. Any heavy duty string or light rope can be used for this purpose. As you can imagine the same gill plates and fins that can stick and/or cut your hand can damage this string or rope, so various methods have been used to make this less likely to occur with ones that are commercially available. Advantages of this method include they are small in size so that they are easily carried about and they are easily adaptable to a variety of fishing environments from shoreline fishing, to canoe or small boat fishing to fly fishing for trout. 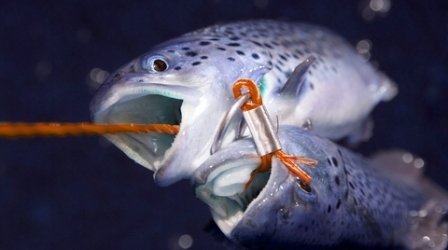 Several features to plain rope as a fish stringer have been added over the years. Common fish stringer showing metal end going through a trout gill. Same type of common fish stringer shown holding two nice trout. The fish above are secured on a stringer similar to the one shown just below them. Click on this link to read more about this excellent stringer. As an Amazon Associate we earn from qualifying purchases. Recommended items have been personally owned, tested or we have fished with anglers who were using them. Still easy to carry, but with a stronger snap stringers offer metal lockable snap hoops and are also common. Most will hold 6-10 fish. These are generally made from a steel cable or steel chain for durability. Shown above is a steel cable coated with plastic and below is a stringer full of fish made with metal chain. Each lockable hook passes through the gill and out the mouth similar to the stringer above. Each fish has its own hook unlike the stringer above where all fish are next to each other before the end is passed through the ring to hold them all in place. Keeping one on hand along with a working live well can be very helpful in your quest to fill your freezer with fresh tasting fish. 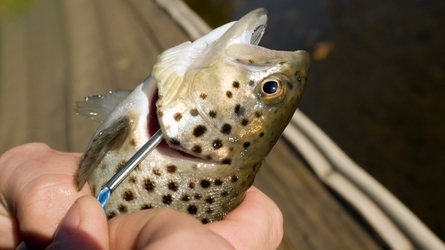 What will you do with your fish from the time you catch them until you clean them? You have two basic choices - put them on ice, or keep them alive via a stringer or live well. Live Well or Fish Stringer? A very simple non electric live well container is a floating fish basket. These are wire mess baskets which float and have a spring loaded lid-opening through which you place your caught fish. Using a floating fish basket will require you to place the basket into the water tied to the boat with a rope. Every time that you move your boat the fish basket will need to be placed into the boat. Shown below is the Eagle Claw 19" x 30" wire fish basket. A more traditional live well is a container into which is pumped fresh water. Caught fish are placed into this container enabling you to keep your fish alive until cleaning. The battered powered water pump both aerates and recycles fresh lake water into that container. Live wells have a way for this water to drain back into the lake when full so that the water will not spill into your boat. A live well can be made from a cooler that you might pick up at a garage sale. You can buy all the parts to make your own live well at many fishing departments. It is nice to know where you purchased these parts so that you are able to make repairs to an already existing system. Shown above is a Johnson Live Well Kit, click on the picture to read about it. You can buy kits like this, or you can by the individual parts with stronger pumps. You can get very elaborate and connect these to the outside of your boat to draw in fresh lake water, but would also have to allow for an overflow vent if you chose to make it this way. Or, you can simply make the pump aerate the water by recirculating it and regularly empty a gallon or so of the water and replace it with fresh lake water. The more fish you have and the larger the fish the more you will have to do this.